Roving Magic, sometimes called strolling, walk-around or close-up magic is the most popular form of corporate adult magic entertainment and for a very good reason. There is no other type of entertainment that matches close-up magic. Close-up magic happens right in your own hands, right before your very eyes. It’s very interactive, it gets people laughing and communicating, the perfect ‘icebreaker’. It’s funny, mysterious and sometimes shocking…in a good way! And all performed on a personal level with wit and humour, what more could you ask for, it is “the stress free option”. The best thing about roving magic is that it is a versatile, flexible and interactive form of entertainment. It can cater to all age groups and fits into just about any social function. 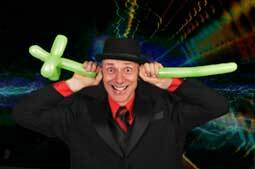 With roving magic entertainment, the only thing you need to do is nominate a suitable start time, it‘s that simple. Roving magic is suitable for any event with over 30 guests, a skilled close-up magician can cater to up to 100 guests in 1 hour and you may like to consider a longer duration or multiple magicians if you have a larger event. The two main times to hire a roving magician are as a ‘meet and greet’ at the start of a function to help people relax and start having some fun or after the main meal when everyone is feeling content and is now looking for entertainment. If I could just let you know what sets my style of roving magic apart from all others, and it is a bit of a secret, so don’t tell. The mistake all others make is thinking that it must be magic ‘up close’ and only entertains a few people at any given time, the spectators are looking ‘down’ at the magic. My style is to get the spectators looking ‘up’ and engage a larger group, more like a mini stage show. The effect is far more dramatic and entertaining, it creates a buzz and anticipation in the room as others see all the fun being had, it makes all the difference. Most of my close-up entertainment is at wedding receptions, corporate celebrations and private adult parties, birthdays, anniversaries, that sort of thing, but if you have a special event, I can tailor the magic to suit. This entry was posted in Posts and tagged . Bookmark the permalink.